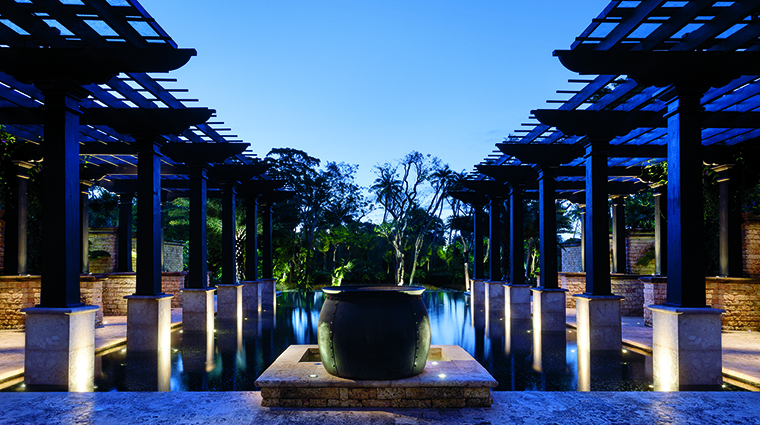 Entering Spa Botánico, a five-acre sanctuary within Dorado Beach, A Ritz-Carlton Reserve, feels a bit like discovering a lost world where healing botanicals bloom wildly. 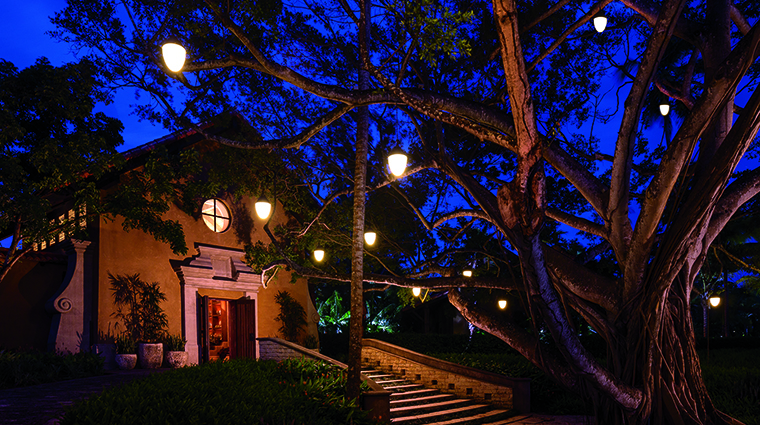 A towering 80-year-old ficus tree strung with globe lights guards an apothecary portal where herbs line each wall and planters hang from a vaulted ceiling. Step through the weathered arrival portal into the nature-inspired, open-air spa, and you’ll next glimpse a long, vine-draped pergola shading a reflection pool and, beyond that, a pineapple garden. Choose any winding path and you’ll find treasures from waterfall showers spilling out of old-fashioned barrels to plunge pools seemingly built into the jungle. There is a twist to this scene, however: Though Spa Botánico looks like a centuries-old secret retreat, it was built in 2012. The result is a thoroughly modern spa with Caribbean character and perfect-for-privacy foliage to spare. The amenities at this Puerto Rico spa are as bountiful as its herb gardens. Changing rooms, in which each locker is etched with a botanical image and an antique apothecary placard reading “Dr. R. Marty” hangs on the door, have copper vanities stocked with toiletries — a shower cap, razor and comb are already in your locker — plus mango candy for a pre-treatment pick-me-up. Men’s and ladies’ relaxation rooms are reminiscent of luxury barns, with floral prints stacked to the rafters, dark wood planks underfoot and pillow- and blanket-strewn chaises facing a wall of windows. A selection of magazines, fruit and nut snacks, and Harney & Sons teas enhance your downtime. 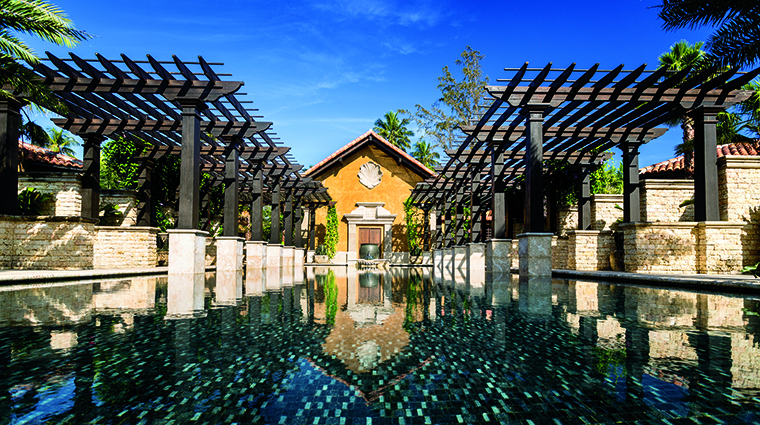 Outside, past a steam pavilion designed to resemble a tree house or jungle hut, you’ll find the spa’s purification gardens, where a variety of warm and cool pools are tucked beneath palm fronds and boulders. The natural landscaping makes it easy to forget you’re in a spa at all. For a reminder, simply step into the full-service salon, a spacious, sunlit building with yet more plants hanging from the ceiling and a list of local spa ingredients — cacao, guanabana, miel (honey) — etched onto the walls. The island retreat requires a minimum of 24-hours notice if you need to reschedule or cancel your appointment. Reservations can be made via email or calling the spa facility directly. Guests must be at least 16 years old to experience the spa’s relaxing services, but the salon is open to kids of all ages. In addition to botanically inspired products, you'll also find treatments featuring your favorite brands, such as a range of facials using Natura Bissé's extra-luxe skincare line. True to its focus on naturally derived healing practices, Spa Botánico uses products, such as lemongrass-ginger massage oil, created from herbs grown in the onsite gardens. 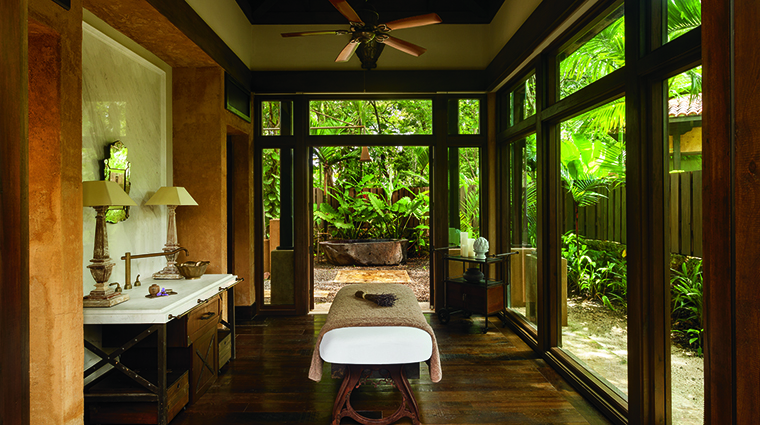 The earthy spa offers a host of facials, manicures and pedicures — including several designed for men — plus massages, couples treatments and “Spa Botánico rituals” targeting everyone from travelers (with polishing crystals and a mud wrap) to sun worshippers (with a soothing post-beach formula) to the “mamá to be” (with herbal poultices). Of the handful of massage therapies available, Ebb & Flow is a rhythmic kneading most similar to the classic Swedish version. 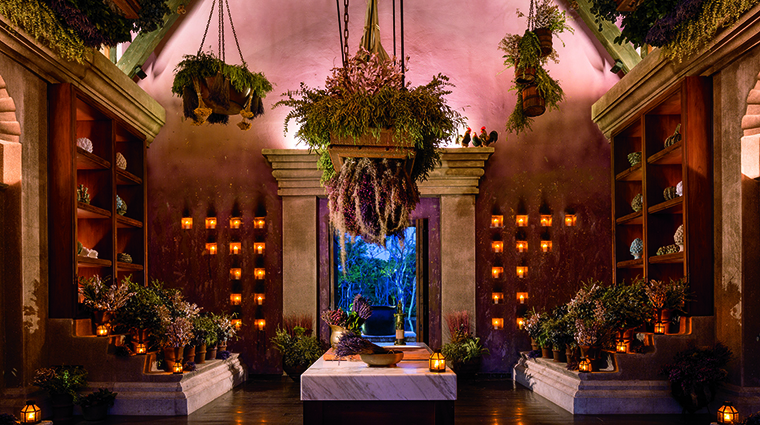 The ManoSantas Apothecary Ritual, on the other hand, may be the most unusual; this three-hour massage treatment begins with a consultation with a manosanta, or traditional Puerto Rican healer, to formulate a custom blend of botanical massage oils. Those looking for a haircut, blowout, makeup application or waxing service will find it at the spa’s luxe salon, which will pamper you until you emerge at Dorado Beach, A Ritz-Carlton Reserve a new person. Ten standalone treatment pavilions, including one couples suite, feature floor-to-ceiling windows on three sides. Though you can see out, rest assured no one can peek in, as outdoor walls and mature trees shroud the rooms in privacy. Soaring, wood-beamed ceilings are outfitted with fans; wood floors complete the rustic look. 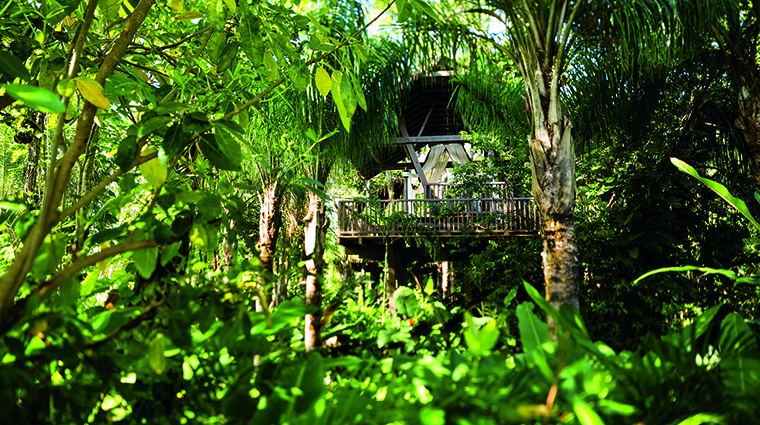 For the ultimate connection with nature, though, book one of Spa Botánico’s two tree house massage platforms. 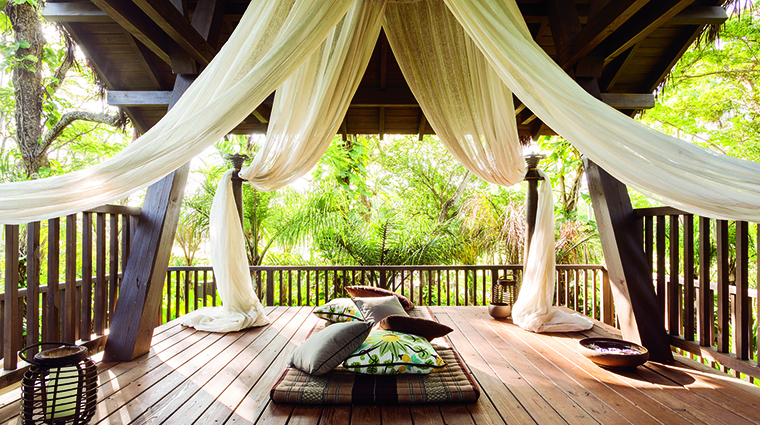 In this outdoor environment, save for a thatched roof and billowing white curtains, you’ll enjoy treatments specially created for the elevated spaces. Indulge in a hammock massage or a Thai massage on a padded mat, among other options.